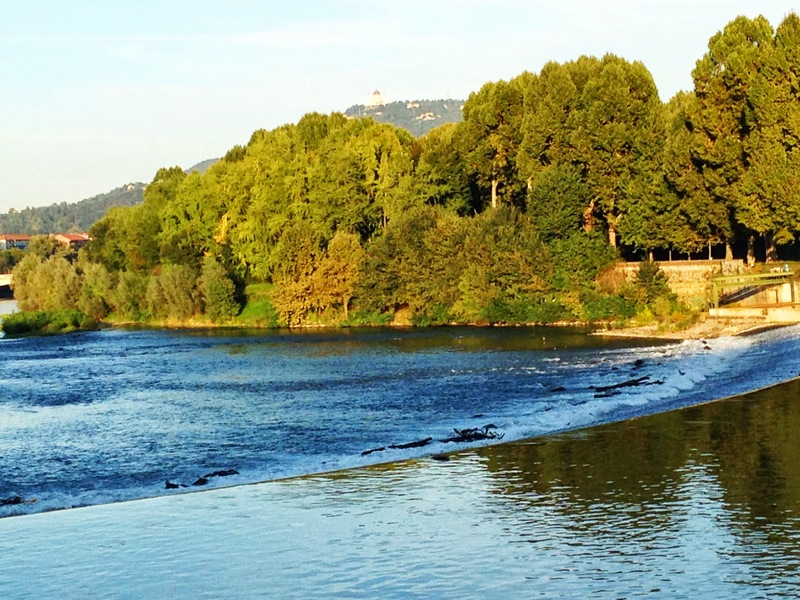 If you've ever looked eastwards from central Turin, you'll see a ridge of green hills across the river, full of nature, looking like the perfect place for a great trail run. Well, that's just what it is. 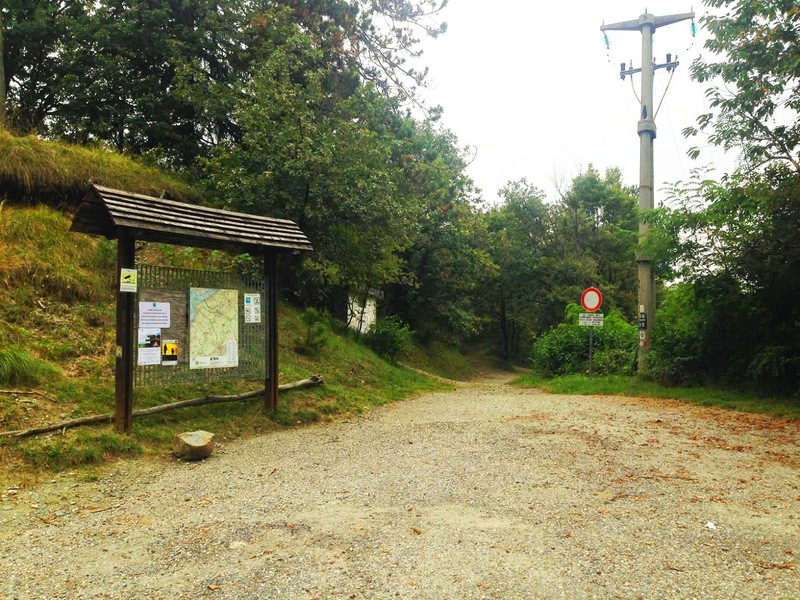 There is a big nature reserve around the highest hill, Superga, far from the urban bustle in the heart of town. You may have seen it: Superga is the tall 672-meter-high hill crowned by a big church, a cathedral, really. From the top of the hill, you can take various trails back down to the river and the center of town. 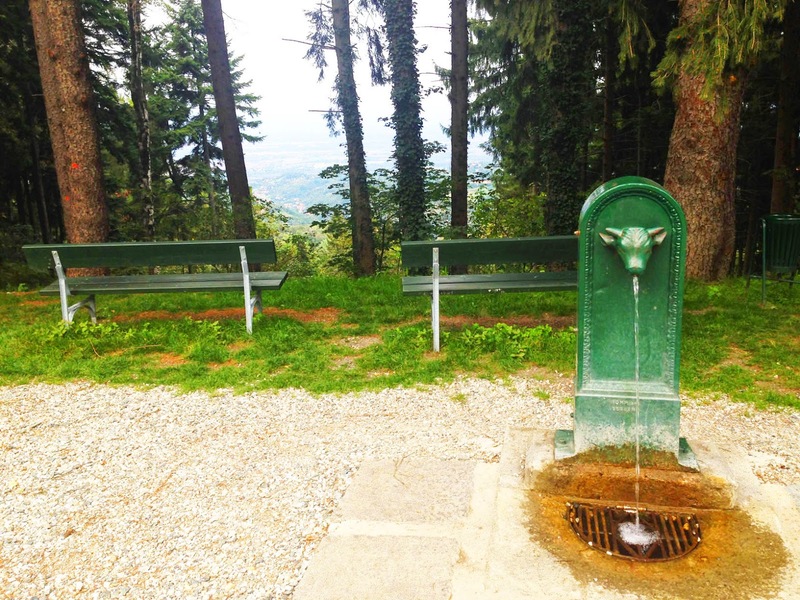 This trail-run heads south of the Superga cathedral along the panoramic road through the Collina di Superga nature preserve, then turns west to follow a little trail down to a stream-valley, where small roads take you back to the River Po in the city. Of course, you could also run all the way to the top, but I thought I would plot a route here that more people would want to run, avoiding the 440-meter climb. A nice feature of a run at Superga, is you get to see the huge domed basilica, plus you can take the wonderful old cog-train up to the top. They're both worth experiencing on their own. So, if you're ready to get going, then get yourself to the piazza called Sassi (also called Piazza Modena) at the base of Superga hill, on the other side of the river. To get there, take tram-line 15 from Piazza Castelo in the city center to Sassi (Piazza Modena). The little station for the cog-railway is right there at Sassi. Tickets cost €4 for a one-way ticket, and the train leaves every hour on the hour (and returns from Superga every hour on the half-hour). If you missed the train, you can also get to top with the 79B bus, which also runs once an hour. 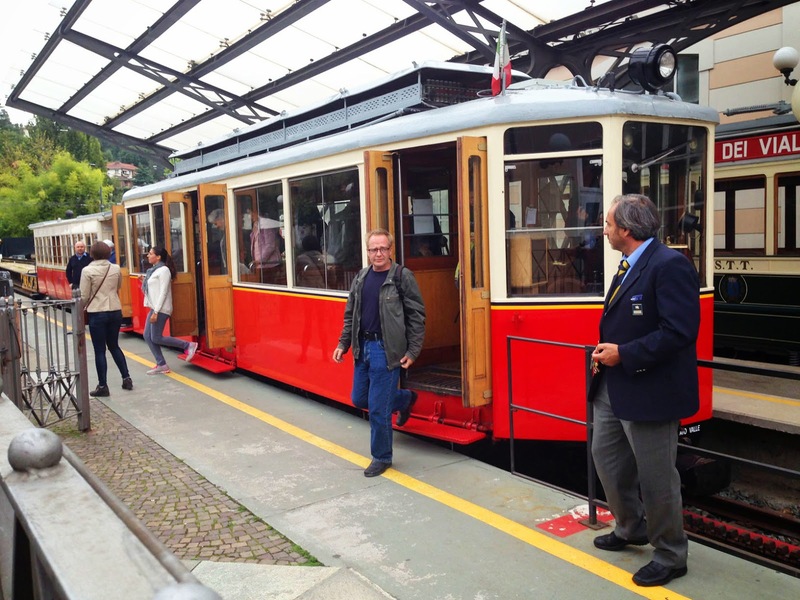 The bus goes up Via Superga, which runs parallel to the train line. Definitely, taking the train is the way to get there in style. The old wooden cars ooze old-world ambiance. It vibrates and shakes its way up the hill, grinding through a few tunnels and nice views open up occasionally in both directions. The train dumps you out at the top of the hill, just beneath the cathedral. You need to follow the trail a short way up the hill to get to the church. 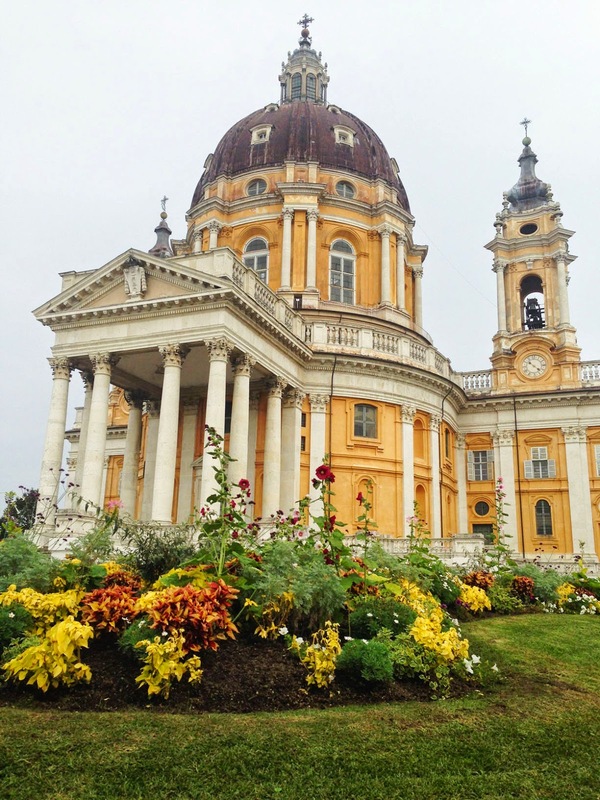 The yellow, classical basilica is beautiful enough on its own, and the terraces out front provide a great view of areas north and west, looking out at the nearby Alps. If you're lucky, and the air is clear, it looks like you can reach out and touch the snow-capped mountains along the horizon. I was there on the one cloudy day of the week, but that's my bad luck. The basilica was built by a Piedmont king as thanks for a won battle, and the tombs of the royal family are found in the cellars. So, once you had a chance to enjoy the views, now is the time to enjoy the run. Facing the cathedral, turn to your right and run to the trail map posted at the left edge of the parking lot. The map is at the trailhead. Now, just follow the rocky trail downwards from the parking lot. After 200 meters, it comes out to Via Superga at a trattoria. It smells so good there that you might just want to quit the run right on the spot. But if you decide, heavy-heartedly, to carry on, turn left and run 100 meters until you see a turnoff heading uphill on the right side, and a sign for "Pino Torinese" (the next little town) and "Panoramica". 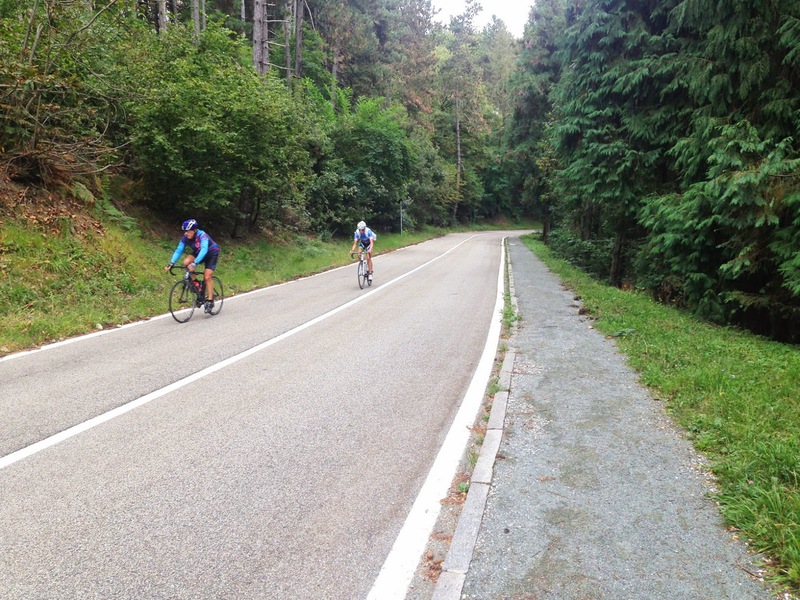 This is the Strada dei Colli (also called Panoramica), where you have to head uphill past some houses for a few minutes, but then it flattens out and then heads downhill from there, through the green scenery of Parco Naturale della Collina di Superga. The road is pleasant enough, heading through green woods almost the whole time. There is a gravel footpath along the side of the road for most of the way. There's not much traffic: I ran it in the evening rush hour and the only vehicle that passed me was a park tractor. The road is mainly used by bicyclists. Panoramica lives up to its name: every once in a while, you'll pass a panoramic lookout spot to either side, or back towards the basilica. At the 3-kilometer spot, at Monte Aman, where the road serpentines sharply to the left, you'll see a gravel parking lot on the right side, with a trail-map and bulletin-board, and a cement electric pole. Turn right and follow the dirt trail that begins there, heading westwards. 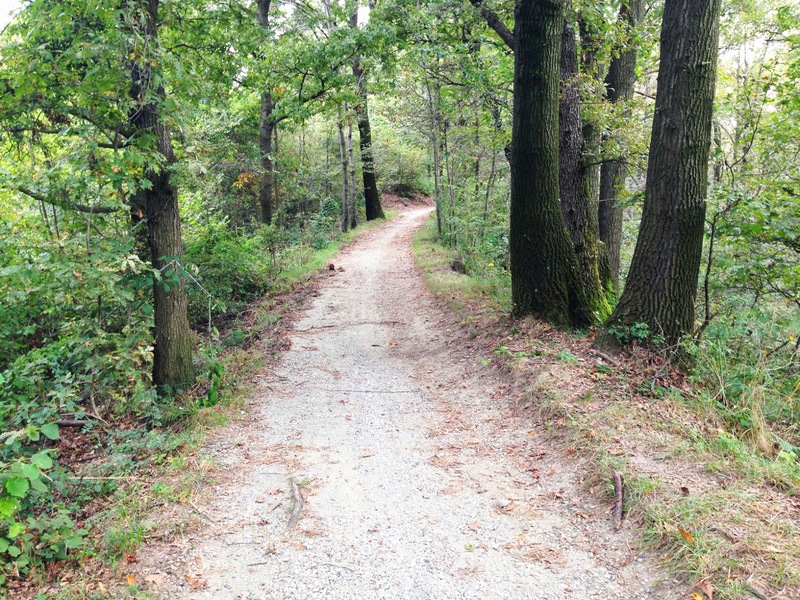 At this spot, the run becomes a real trail-run, winding through pure nature. NOTE: If you don't want to run on this lonely trail, you could just keep following Panoramica for five more kilometers down to Pino Torinese, and take bus-line 30 back to town from there. 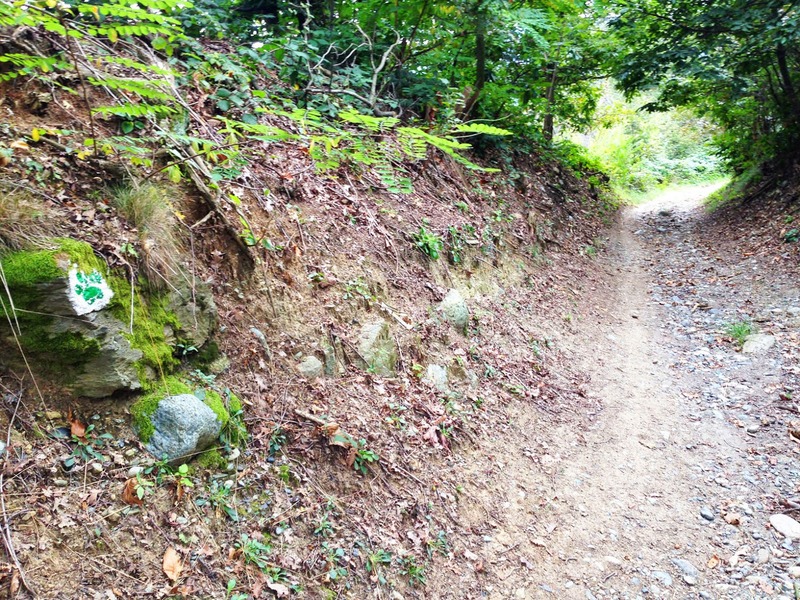 At Monte Aman, follow the trail markers with the green paw-print. I wanted to follow park trail 24, but there were no markers for it. But the green paw prints follow the same stretch of trail. After just a minute, you'll come to a junction in the trail, where one trail turns south to head downhill, with a sign pointing to "Il Sentiero degli Alberi". Don't turn left there: keep straight. Just keep following the green paw-print trail markers. The first section of trail takes you along the top of the narrow ridge of Monte Aman, heading west into the valley separating this ridge from the main Superga hill. Then it starts switch-backing downhill to the valley floor. The trail is heavily eroded in many places on the way down, exposing lots of rocks. You won't be setting any speed-records here: this trail is more for adventure than for setting a personal best time. It is used more by mountain-bikers than hikers or runners. After a while, the markers stop for a long time, but then they start again further down into the valley. Sometimes the serpentines wind ridiculously back and forth, taking 50 meters of running to go down 2 meters in height. Other times, the trail is ridiculously steep, and you can only take slow, baby-steps going down the almost vertical, slippery clay. When you reach the valley floor, the trail comes to a stream, which you must ford at a shallow spot. There are enough stones, though, to arrive at the other side with dry feet. 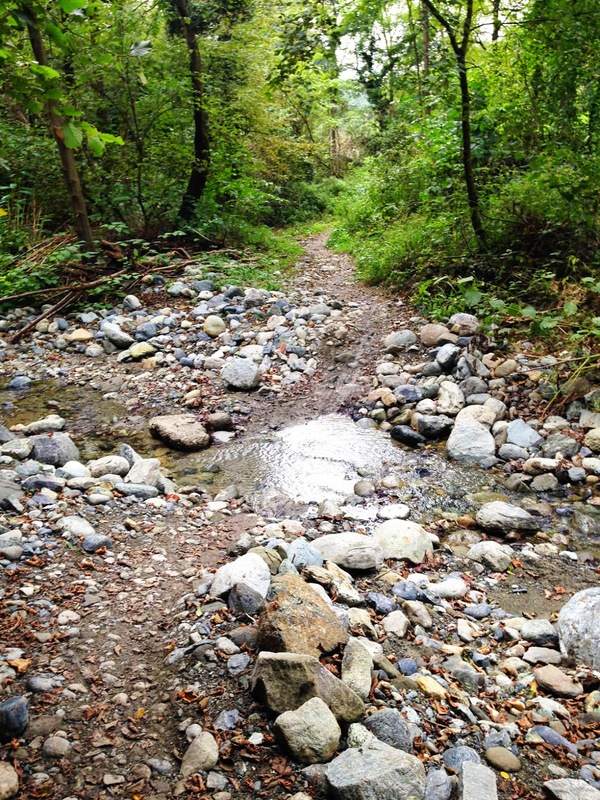 On the other side of the stream, there is a little paved road following the course of the stream. Take it towards the left (west), still heading downhill. It soon goes under a bridge for the main highway that runs between Pino Torinese and Turin. The little street then continues until it ends shortly by running into Strada del Cartman. Now turn right and run downhill along Strada del Cartman, back towards Turin, still following the stream on one side of the road. The road is quiet here, lined with little country homes. You'll quickly come to a bus stop. You could take the 54 bus back to town, but it only runs once an hour. Good luck trying to figure out the departure times. I just ran the 2.5 kilometers back to Sassi. When Strada del Cartman merges into Strada Mongreno, the neighborhood becomes more urban, with apartment houses lining the street, and more traffic. But to make it nicer, there's also a fresh water fountain next to the sidewalk at one spot. 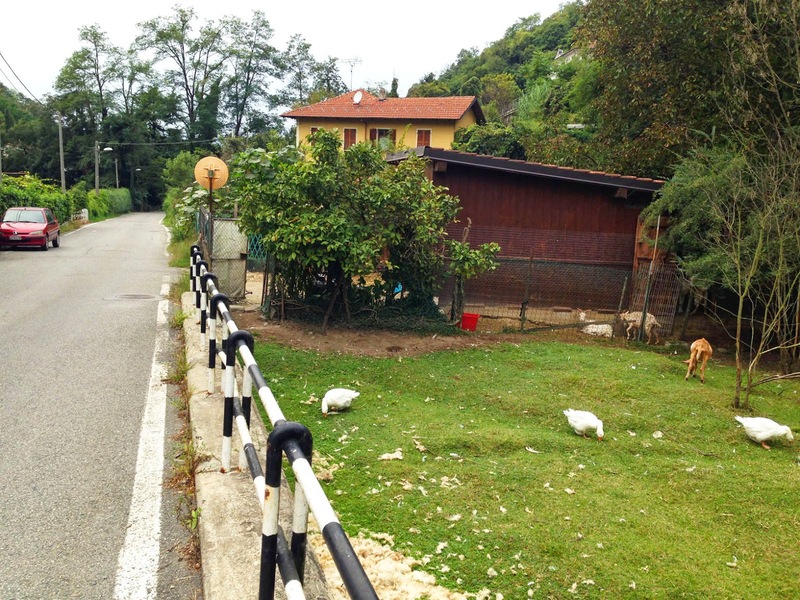 Just keep running straight downhill along Strada Mongreno until you come to a roundabout at Piazza Bande Nere, where you turn right, and run a block to the Superga cog-railroad station again. Now turn left and run the one block back to Sassi, past the station.